O Captain! My Captain! Steering the ship through a quagmire of looming deadlines, dwindling budgets and all sorts of other bumps and blocks, the role of a producer is one of many challenges. They must ensure development is running smoothly and communication is flowing between departments, but the biggest challenge of all is boosting the game’s key performance indicators. Producers are embroiled in this constant battle and retention is right at the top of the list. And for good reason. If your game can’t retain enough players, the likelihood of turning a profit will be diminished. But fear not, for there’s a number of clever strategies you can employ to come out of this bloody battle victorious. 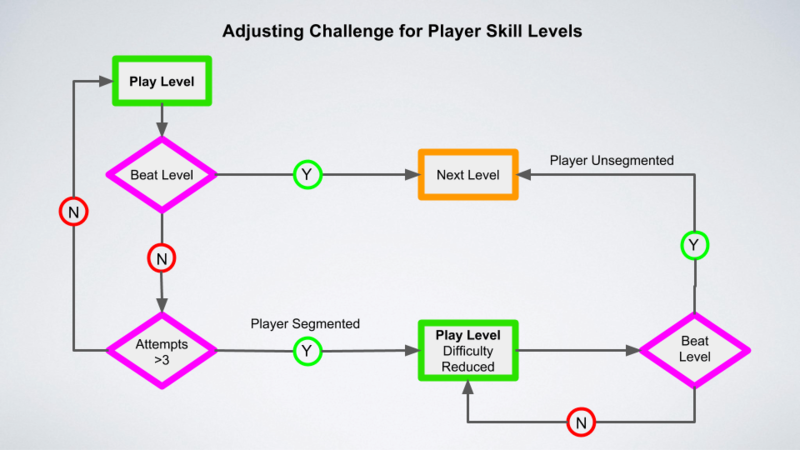 Typically games are designed with a singular difficulty curve that all players must contend with, but since games attract players from a wide range of skill sets, this one size fits all approach doesn’t always work. The challenge craved by a proficient player may alienate a novice by ramping up the difficulty too soon and the same can be said in reverse. By assuming all players are the same, you are likely to lose players due to frustration or boredom, by taking a segmented approach and delivering the right level of challenge to each set of players, you can reduce friction and ensure everyone has a great experience in their own unique way. Let’s say you are designing the next big puzzle game hit and level 10 is the first big difficulty spike in your game. Your difficulty curve intends for players to fail this level three times before beating it, however, a set of novice players failed this level more than 6 times and quit due to frustration. To put a stop to this fire, auto-segment players who fail the level more than intended and dynamically reduce the challenge for them. The challenge can be reduced in many ways, perhaps you grant them additional moves or gift them a free booster to help them out. Executing an alteration like this is particularly useful in the early stages where players are more prone to churning. By easing them into the mid-game, they are likely to become more accustomed to the mechanics and also more invested in the game. Although new players are important, it is also vital to consider returning players who have been absent from your game for an extended period of time. Imagine you have a successful 1v1 real-time multiplayer game that you are constantly updating with new content and balancing changes, but you notice that a set of players who are returning after a lengthy break are struggling to face competition of a similar level, and as a result are leaving. For players returning to your game after a significant absence period, updates and balance changes can be an overwhelming experience. If the once accustomed to solid strategy is no longer viable or they have simply forgotten how to play your game, this set of players could be stomped by the opposition and rage quit out of frustration. To prevent this, you should give these players some breathing space to adapt and re-establish their competitive footing. One solution would be to segment these absent players and adjust the matchmaking rules to pair them with lower ranked opponents when they return, thus increasing their chances of winning and giving them the motivation to power on. 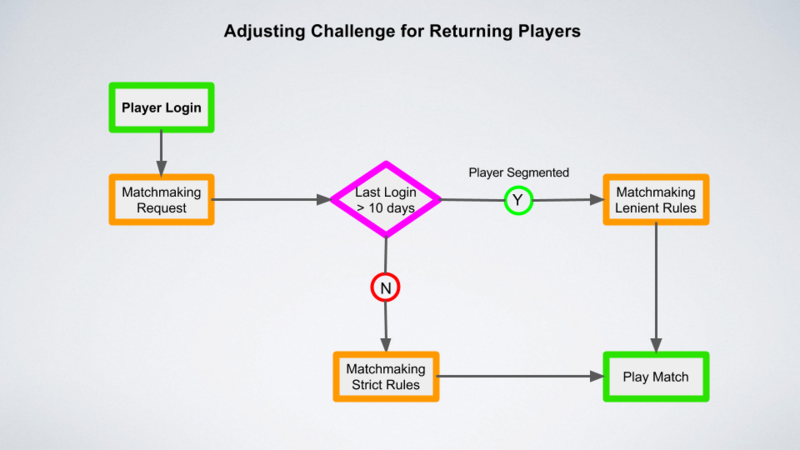 Ultimately, the main objective for players that have left your game is to get them to return. Some might be okay with not making progress every single day, but if a juicy carrot is dangled in front of them as bait, their heads may just be turned. 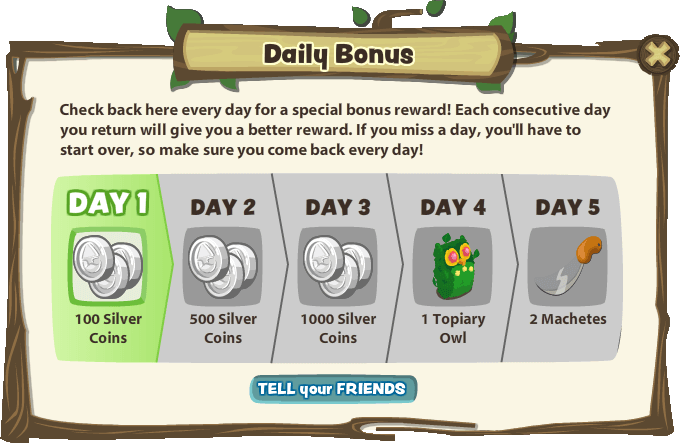 A simple and commonly used retention mechanic is the daily bonus, which rewards players for logging into the game once per day. Whatever form the reward takes, it should offer good value and encourage players to engage with the game’s core loops. You could also take it up a notch and offer incrementing bonuses for each consecutive day returned. This is a great way to reward your most valuable players and further encourage them to keep coming back to earn awesome goodies. To get the best results, have some fun with how you package this mechanic! You want to engage players, not bore them to death with lifeless popup windows, so turn it into a self-contained experience that fits with the theme of your game. For example, it could be presented as a prize wheel, slot machine or some other simple but enjoyable mini-game. Daily challenges are another engaging reward mechanic to entice repeat visits. A great example can be found in Blizzard’s Hearthstone, who use a Daily Quest system that offers players one quest per day, such as winning 3 games as a certain class, or to play a match with a friend. These mini-challenges spice up gameplay sessions and reward players for trying out different strategies and card combinations. 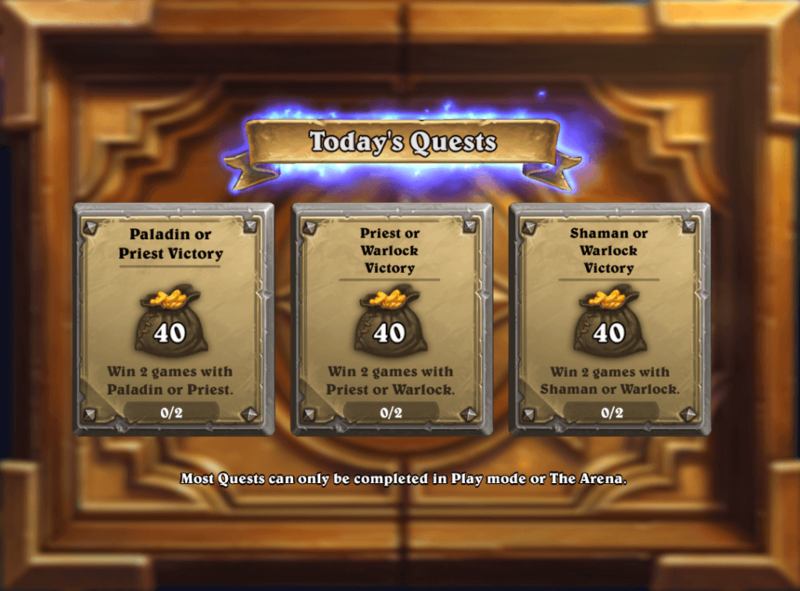 A maximum of three quests can be stored up but players can swap out one quest per day if they aren’t feeling it or want to chance their luck with something even more challenging. It goes without saying that all humans love to be rewarded. It is deeply ingrained in us all to crave the rush of endorphins we get from completing tasks and receiving praise. This effect is super-charged when collectable rewards are attached. To make the most of this human trait, start building an association between progress and rewards as early as possible. Employing this positive reinforcement strategy will build expectation for players, leading them into a habitual loop that keeps them coming back for another feel-good hit. You levelled up, have a bag of gold! You built your first town, have a loot chest! You topped the leaderboard, have a golden gun! Remember that rewarded virtual goods should have a clear value and description to encourage their use in core gameplay sessions. The last thing you want is players stockpiling rewards because they have no apparent use or are just plain unrewarding to use. While the goal is to reward progress and reinforce that association, progress is progress, no matter how small. Just because a player is on a losing streak, doesn’t mean they shouldn’t be rewarded on some scale for their efforts. Clash Royale has an elegant solution for this – for each opponent tower you destroy, you earn a crown, even if you lose. After earning ten crowns you unlock a nice loot chest. This is a great way to encourage players to keep going despite a negative result. Players spend far more time outside your game than in it, so a great way to remind them to return is through a clever use of push notifications. Practically every game or app implements them in some way but that doesn’t automatically mean users flock back in their droves. We’ve all been on the receiving end of annoying or deceiving notifications, but in the end, they get found out and end up on the blocked list. To avoid a similar fate, careful consideration should be given to how they are designed and managed. Would this entice you back? Push notifications should be a natural extension of your game and alert players when key events occur. A simple passive message such as “Come back and play” won’t really motivate many to return. Instead, a clear call to action that comes directly from your game loops will get the best click-through rate. In Clash of Clans, players get a push notification whenever their village has been raided. Players are invested in their personal creation and due to a loss of resources, they are enticed back to make up for lost ground. Games that employ time or energy mechanics can also use notifications to great effect. Candy Crush Saga notifies players when their lives have been refilled and Clash Royale tempts players back in by letting them know their gold chest is ready to open. It doesn’t stop there. Maybe you’re running a special bundle offer or a time-limited event, both are great opportunities for grabbing attention with a notification. However one important point to remember, every added notification, takes you one step closer to spam territory. Consider limiting how many notifications a player can receive each day and create a prioritised list to make sure they are getting the most important and relevant messages. Ultimately, players need to trust that by clicking on your push notifications and returning to your game, something good will happen and you aren’t wasting their time. With so many games to choose from, on top of countless other distractions, it has become harder and harder for a game to retain players. Producers are in the thick of this battle, guiding their teams to rise above the challenge and keep their players engaged and returning every day. By adjusting the challenge and straddling the line between frustration and boredom, rewarding progress and encouraging players to come back every day through challenges and bonus rewards, you can positively affect retention and emerge victoriously. Keep up-to-date with industry insight every fortnight right to your inbox! "There is no way we would have been able to meet our launch date trying to roll our own servers and build this functionality ourselves, so we are very grateful to have a partner in developing World War Toons as professional and supportive as Gamesparks"
Studio Roqovan, World War Toons - Debut VR and PS4 Console title. "GameSparks saved us a lot of time and provided us with great service and support. We love GameSparks and are sticking with it going forward." Hutch Games, MMX Racing - As featured on iTunes worldwide. 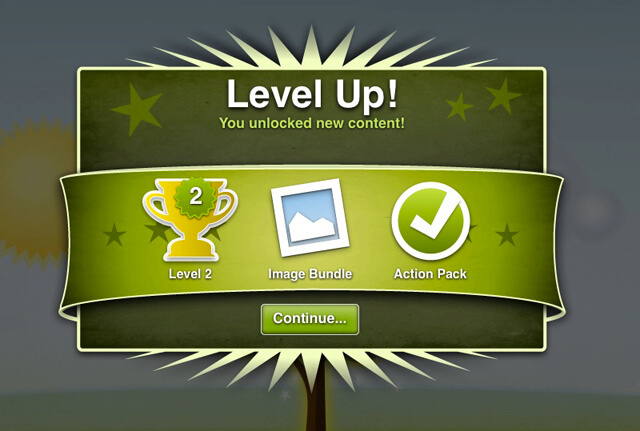 "We see GameSparks as an extension to our own internal backend. It offers us rich social features that have been well developed and scale to our needs." " No GameSparks. No Game! We succeeded in shipping WinterForts, to massive volumes of players online, all thanks to GameSparks’ invaluable product and support." "After evaluating every potential backend service provider, we decided to go ahead with GameSparks. They support more Unity3D platforms than any other provider and their database manager, events system and test harness are extremely powerful and flexible to work with, on top of all the other great features they offer in their easy-to-integrate API."